This adapter creates an external auxiliary audio input source that has a pair of left and right RCA audio inputs or 3.5 headphone aux jack. 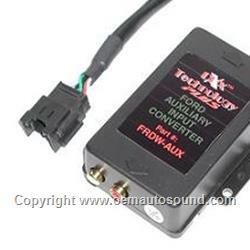 With this converter installed, you can add any external audio device that has an audio output directly to your factory Ford stereo system and it will let you hear the the music from the portable device good for iPod iPhone, satellite radio, GPS, DVD phones with music Pandora or any Mp3 player. If your CD-changer is defective or want to unplug it. This interface will plug into the same CD Ford changer cable. If the factory CD-changer is present, you will need to disconnect it from the factory harness. 1995 to 2006 All Ford vehicles with a CD-changer cable in the trunk or center console. Ford Escape 6 CD-changer under the seat. If you are having issues with the CD changer in your Ford Explorer or Mercury Mountaineer this is a great option to install. You don't have to run any wires or do any crazy mods to your OEM factory system. Just unplug your factory CD changer and plug this baby in. It sends a false signal to your head unit making it think that your cd changer is running. All you need is an RCA to 3.5mm adapter audio cable so you can plug in your MP3 player or your phone to listen to MP3's. Great little option. Took me about ten minutes to install.